The 36,520 acre Bull Draw Fire which started July 29 from a lightning strike, is now 100% contained. 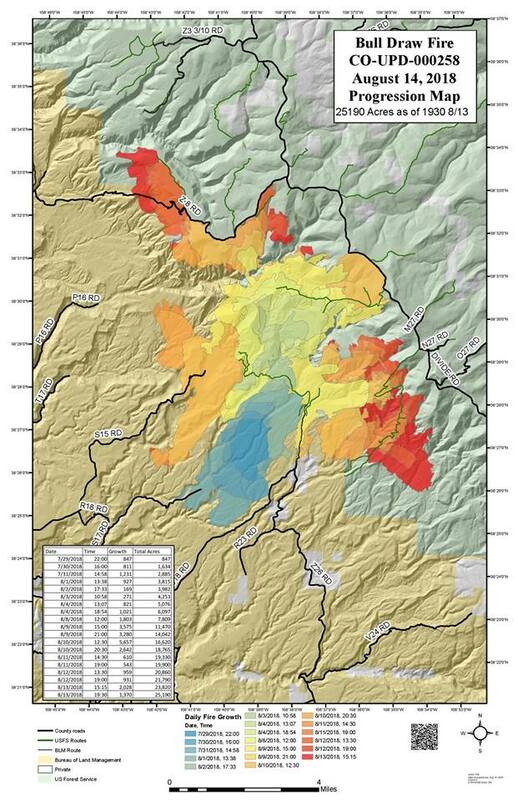 The fire area has received over 5 inches of precipitation from recent storms and is unlikely to grow any further. Firefighters have finished strengthening and securing all containment lines around the Bull Draw Fire and have been demobilized from the incident. Yesterday, the Bull Draw Fire was officially declared contained and no further suppression action is expected be taken in the area. Hunters and others entering recently burned areas should exercise caution and understand that fire can create forest hazards. Fire-weakened trees may fall suddenly, and roots of trees can burn underground creating ash pits that may not be readily visible. Burned forests are especially hazardous in windy conditions. Recent rains have also saturated the soils in the burned area, increasing the potential for flash floods or landslides with future storms. The Forest Service would like to thank the many partners and volunteers for their assistance and continued support through the duration of this incident. Planned Activity: At 7:00 am, outgoing Type 3 Incident Commander (IC) Cody Russell transferred command to incoming Type 4 IC Mike Schultz. “Thanks to all the successful, hard work by firefighters over the last couple of weeks, it has allowed us to bring the fire to nearly full containment with a reduction in fire behavior. We feel confident in reducing the number of personnel and transitioning the fire to a Type 4 incident. I would like to thank the public for their tremendous support, understanding, and cooperation during this incident. It’s great to know we have our communities behind us”. – Outgoing IC Cody Russell. The Type 4 team will continue to patrol and monitor fire activity, conduct snagging operations along NFSR 411, and complete suppression repair where needed. Yesterday’s Activity: Crews completed backhaul operations. This entails removing supplies from the fire line such as hoses, pumps, tanks (pumpkins), sprinklers and other equipment put in place for both structure protection and holding fire line. Firefighters patrolled the north and east sides of the fire perimeter along Divide Road. Crews observed an increase in leaves falling to the ground and providing fuel for the fire in aspen stands. All fire activity occurred in pockets and well within the interior. Weather: Today is expected to sunny and dry with temperatures in the mid-60s. There is a potential for wind gusts and relative humidity will be in the 25% to 35% range. No precipitation is forecasted for the next few days. 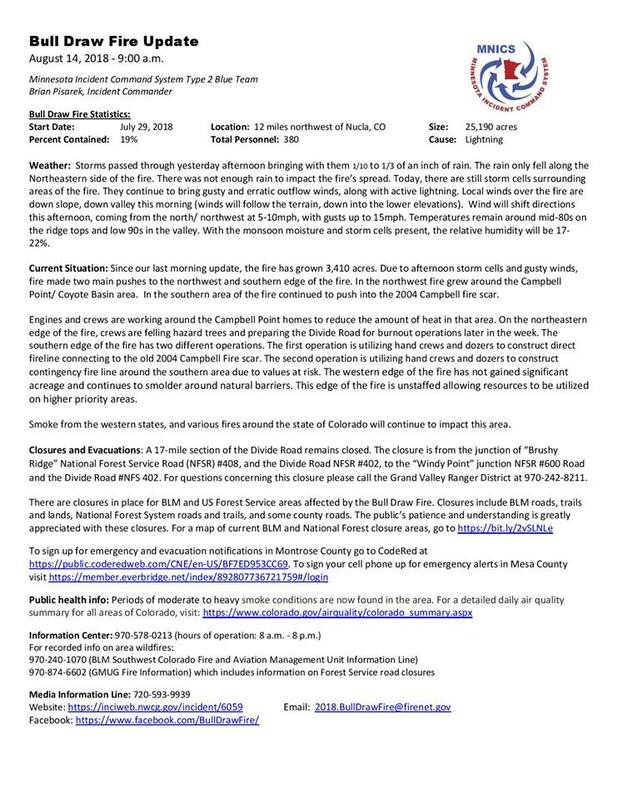 Public Safety: For the safety of the public and fire personnel, travelers are asked to travel slowly and use extreme caution along the Divide Road due to the continued presence of fire crews and equipment. Smoke and dust from fire operations may also affect visibility along the road. The public is asked to observe area closures for the safety of the public and firefighters. Hunters with tags that may be impacted by fire activity can contact the Colorado Parks & Wildlife Montrose Field Office with questions at (970) 252-6000. Temporary Flight Restrictions (TFRs): TFRs are in place around the fire perimeter to provide for the safety of firefighting aircraft and crews on the ground. Authorized Unmanned Aircraft Systems (UAS), or drone, is a useful tool that firefighters use in gathering data, however, unauthorized use of UAS by the public is prohibited near active wildfires due to safety. “If you fly, we can’t”. 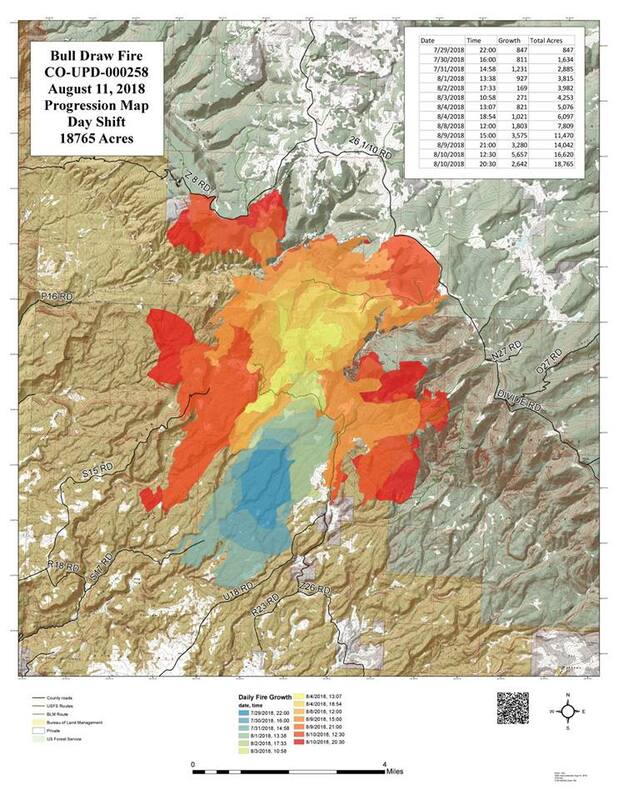 Personnel: 127Yesterday’s Activity: Fire behavior yesterday morning was active in aspen stands near the Big Atkinson drainage, and moderated throughout the day with cooler temperatures and cloud cover. Firefighters conducted some burnout operations from National Forest System Road (NSFR) 402 (Divide Road) near the Big Atkinson drainage before weather conditions stalled successful ignitions. Crews secured edges near NFSR 407, providing strengthened lines near remaining fire in the Long Canyon area. Firefighters near the UC Cow Camp continued to patrol and conduct structure preparation. Firefighters actively worked to locate and contain 22-24 small spot fires, heavily gridding and monitoring the area on the North side of NFSR 402 (Divide Road) to ensure all spotting was contained.Planned Activity: Today firefighters will continue to actively engage in suppression activities on the fire. Weather dependent and where feasible, crews will conduct burnout operations near NFSR 402 (Divide Road) to remove available fuel and strengthen control lines. Firefighters will mop up and patrol areas where spotting occurred yesterday and be on the lookout for potential new spots. Fire personnel will assess the potential success of conducting aerial ignitions in areas of the fire to strategically remove unburned vegetation and fortify control features. 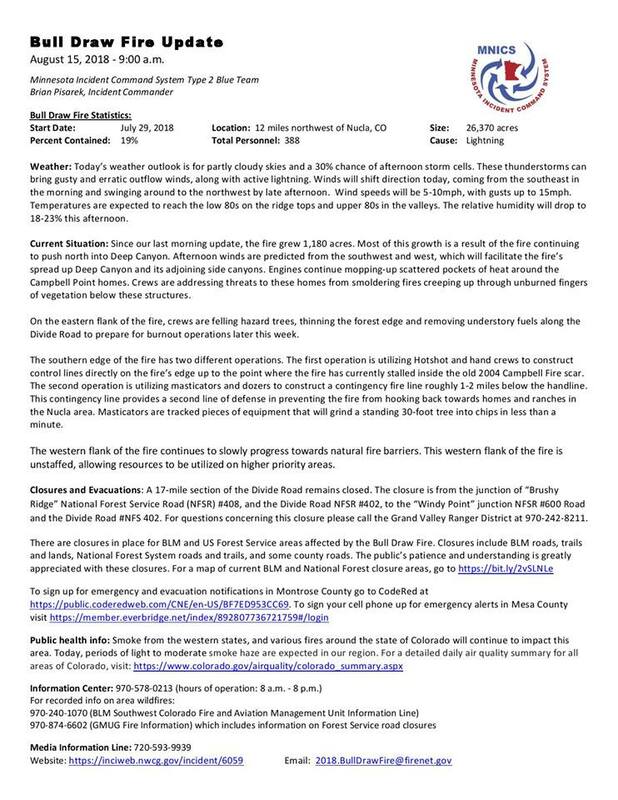 Command of the Bull Draw Fire was transferred to Incident Commander Jerry Wheeless from CorDell Taylor at 7:30am this morning.Weather: Yesterday trace amounts of rain fell in areas of the fire, but did not contribute significantly to moderating fire behavior. Weather today is expected to be partly cloudy in the morning, clear in the afternoon, and partly cloudy again in the evening. Winds may be gusty again today, with the potential to increase fire activity.Temporary Flight Restrictions (TFRs): TFRs were reinstated yesterday for the fire perimeter to provide for the safety of firefighting aircraft and crews on the ground. The public is also reminded that unauthorized Unmanned Aircraft Systems (UAS), or drones, are never allowed near an active wildfire due to safety. “If you fly, we can’t”. Public Safety: Public in the area is encouraged to remain vigilant, be aware of their surroundings, and be prepared to evacuate should the fire threaten their safety. Hunters with tags that may be impacted by fire activity may contact the Colorado Parks & Wildlife Montrose Field Office with questions at (970) 252-6000. 9/18/18 Over the last 48 hours the Bull Draw fire area saw an increase in overall wind activity along with warm and dry conditions. 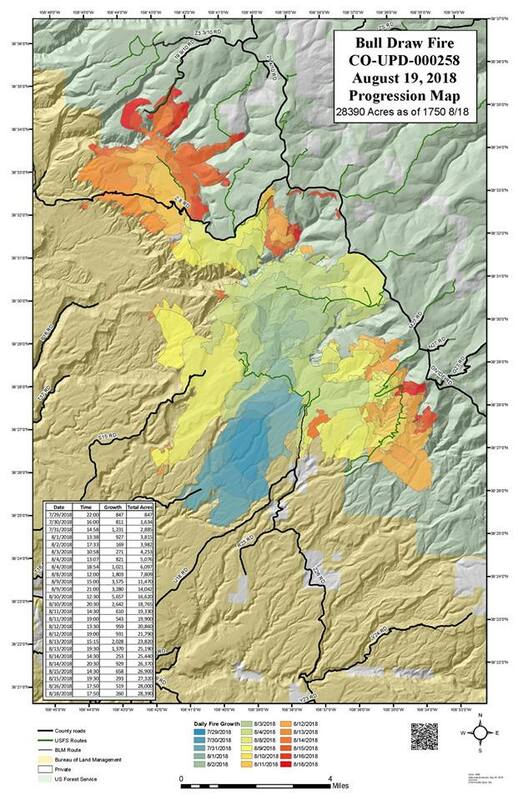 Seasonal leaf fall is attributing to additional available fuels in which the fire is spreading. These conditions have lead to an additional 328 acres burned since the last update, bringing the total acreage to 32,084 as of Monday evening. Increased fire activity is expected today, which may produce additional visible smoke in surrounding areas. The public may encounter fire personnel actively involved in suppression operations and should use caution to provide for public and firefighter safety. The public is also advised to slow down and take extreme caution when traveling along the Divide Road. A fire the size and complexity of the Bull Draw typically requires a “season-ending” event, such as heavy rain and/or snowfall, to be fully extinguished. Until then, responding fire personnel will continue to work diligently to contain the blaze, while contending with the area’s steep and rugged terrain. Current Situation: A Red Flag Warning is in effect from 11am to 9pm today. With the hot, dry and windy conditions, fire activity increased yesterday. As a result the fire grew slightly, increasing in size by 37 acres. Patrolling, suppression repair and backhauling, remain top priorities. Crews are continuing fire suppression repair activities on the southern end of the fire perimeter where fire activity has greatly diminished. On the north side, crews are working on the 407 road in preparation for burnout operation of the line should fire conditions make this necessary. With strong and sometimes gusty SW winds we have witnessed an increase in activity along the Divide Road and a corresponding increase in smoke. Other areas saw some creeping, backing and single tree torching due to the conditions. Divide Road is currently open for vehicular traffic: please note, this could change at any time depending on conditions. With the holiday weekend approaching and opening of big game season more people will be driving vehicles and ATV’s on Divide Road. As a reminder all roads and trails west of Divide Road remain closed in the area of the fire. 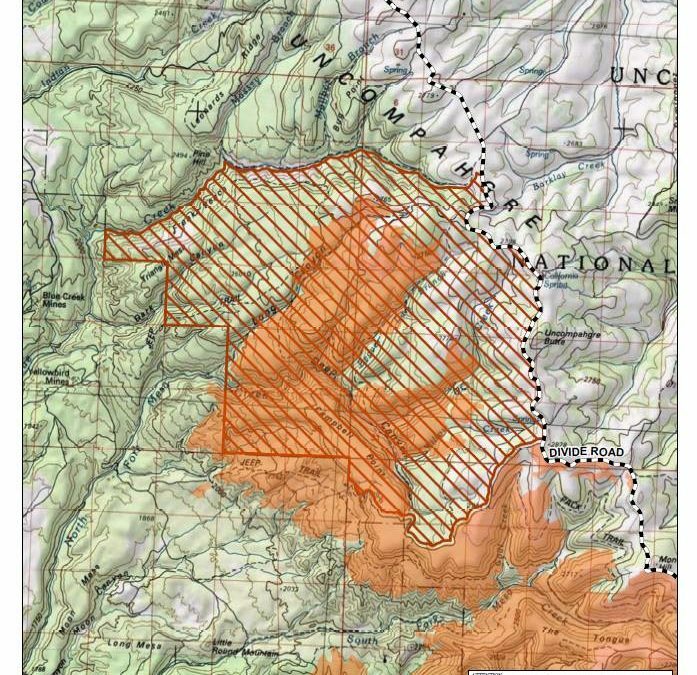 The Grand Mesa, Uncompahgre and Gunnison (GMUG) National Forests closure includes: forest lands bordered south of National Forest System Road (NFSR) 407, south and west of Divide Road down to NFSR 600, Windy Point with the possibility of expansion. Please use caution and reduce speeds as fire crews are also actively working on the fire. Heavy equipment, emergency vehicles, and smoke are likely to be in the area. The public is asked to adhere to these closures and pay close attention to all road signage. The public’s patience and understanding is greatly appreciated on this matter. Weather & Fuel Conditions: Thursday’s forecast includes a continued drying trend with temperatures ranging from 72 to 84 degrees, minimum relative humidity of 11% to 16% with ridge-top wind gusting from the SW up to 35 mph in the afternoon. 8/24/18 Update: Current acreage of the #bulldrawfire is 30,208 acres. This revised number is a result of aerial mapping that occurred yesterday. Containment is 32%. Good morning community. 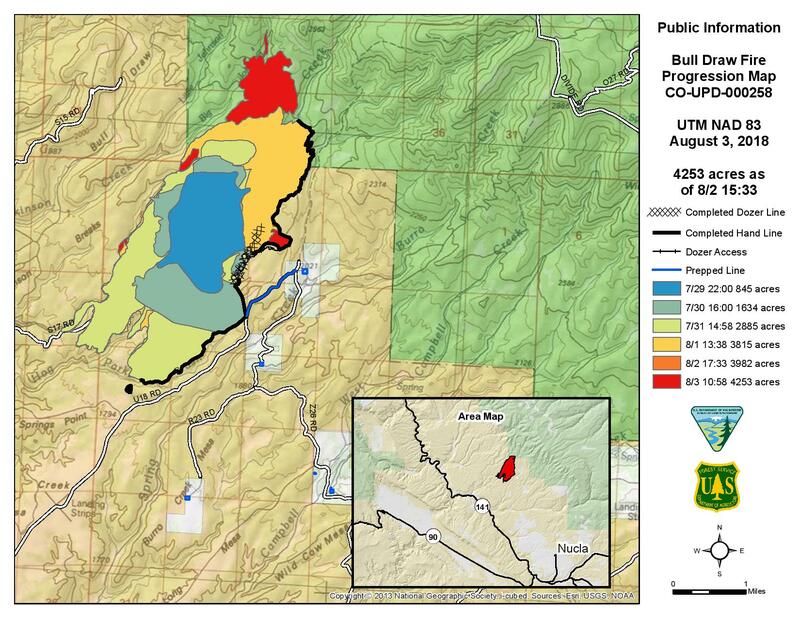 Current acreage of the #bulldrawfire is 29,038 acres. Containment is 21%. In a few hours we’ll be posting today’s detailed update. August 19, 2018 – 10:00 a.m.
Special Notes: Tuesday, August 21st will be the Minnesota Incident Command System Type 2 Blue Team’s last day managing the Bull Draw Fire. The normal time an Incident Management Team is assigned to a fire is between 14 and 21 days, after which they return home to rest and prepare for their next assignment. An orderly transfer of command will occur with another highly qualified team, which will then lead the over 300 personnel who remain on this incident. Paramount in this planning is ensuring that the fire, our firefighters and residents of local communities remain in good hands. Information sources, such as Facebook, Inciweb and the fire information phone line will remain the same. Weather: Breezy winds are expected again today. Drier conditions will continue through Monday, with moisture beginning to return to the area on Tuesday. Daytime minimum relative humidity values will remain at critical levels into Tuesday. Today’s weather outlook is for mostly sunny skies this morning, becoming partly cloudy by afternoon with a 0% chance of showers and thunderstorms. Afternoon winds will be 12-17mph from the north with gusts up to 25mph. High temperatures for the day are expected to be 76-81 on the ridge tops and 82-87 in the valleys. The relative humidity will drop to 11-16% this afternoon. Current Situation: The fire grew by 260 acres yesterday. This growth was mostly a result of the fire pushing further into Long Canyon, and fire backing into previously unburned islands of vegetation inside the fire perimeter. Today, crews will be working to further secure the fireline around the southeastern corner of the fire. Weather permitting, crews will be burning out the unburned vegetation between the fire’s edge and our “indirect” control line along the Divide Road. Today’s “burnout” operation will begin where the handline up from the 2004 Campbell burn scar meets the Divide Road, then proceed north along the road. Once the vegetation adjacent to the indirect control line has been burned, it starves the approaching main fire of fuel, effectively stopping its spread. Crews continue to hold the fire west of the Divide Road. Crews and engines continue to patrol and mop-up the remaining hotspots below the Divide Road and around the fire’s southern perimeter. The western flank of the fire continues to slowly progress towards natural fire barriers. The western flank of the fire remains unstaffed, allowing resources to be utilized on higher priority areas. Three masticators continue thinning the forest edge and removing understory fuels along the Uranium Road as part of our strategy to contain the northwestern flank of the fire. For early season hunters in Unit 61 who may be impacted by the Bull Draw Fire: If you have questions regarding your early season license options you can contact Colorado Parks & Wildlife at the Montrose office at 970-252-6000. 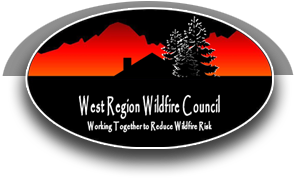 Fire Restrictions: Stage 1 Fire Restrictions are in effect for: National Forest lands on the Uncompahgre Plateau and Grand Mesa, BLM lands within the Uncompahgre Plateau Resource Area, unincorporated lands within Montrose and Mesa Counties. 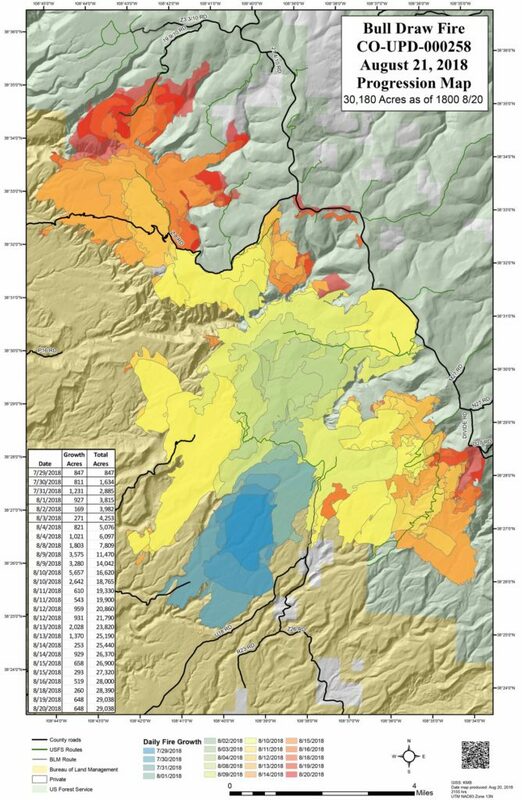 Specific fire restriction information can be found at – GMUG Info: https://www.fs.usda.gov/detail/gmug/home/…, Mesa County Fire Info: https://bit.ly/2MkFcQc, and Montrose County Fire Info: https://bit.ly/2PgT3t9. August 17, 2018 – 10:00 a.m.
Mesa County Fire Info: https://bit.ly/2MkFcQc, Montrose County Fire Info: https://bit.ly/2PgT3t9. 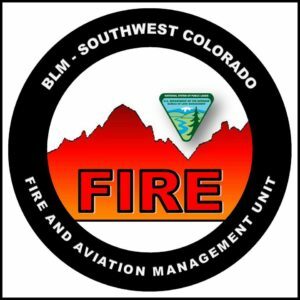 BLM and National Forest lands, roads and trails affected by the Bull Draw Fire are closed to public use. season license options you can contact Colorado Parks & Wildlife at the Montrose office at 970-252-6000.
day are expected to be 79-84 on the ridge tops and 85-90 in the valleys. The relative humidity will drop to 15-20% this afternoon. fires up to ¼ mile ahead of the fire’s leading edge. Road as part of our strategy to contain the northwestern flank of the fire. towards homes and ranches north of Nucla. allowing resources to be utilized on higher priority areas. 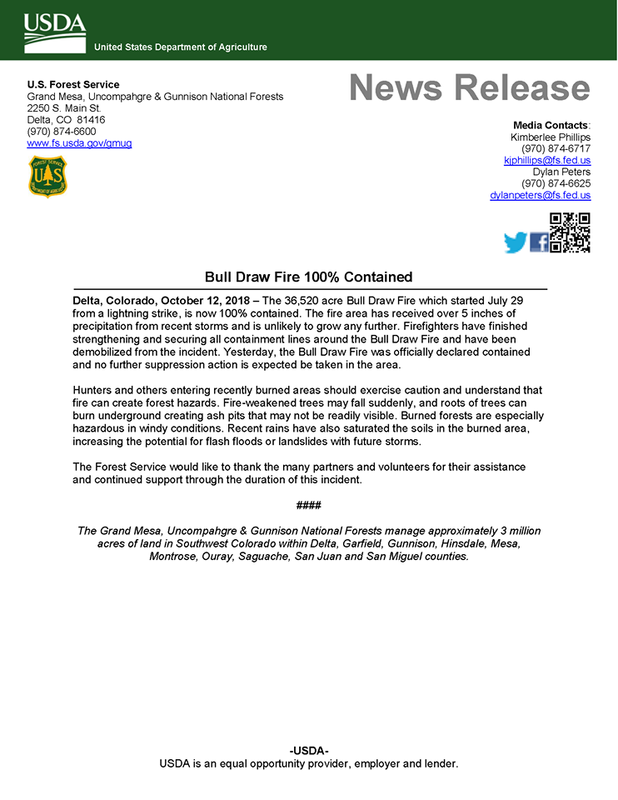 Delta, Colorado, August 17, 2018 – The Grand Mesa, Uncompahgre and Gunnison (GMUG) National Forests have announced further closures in response to the Bull Draw Fire. The remote blaze, burning 12 miles northwest of Nucla, has reached approximately 27,320 acres and is burning on both the Bureau of Land Management (BLM) and Forest Service lands. • The area bordered on the northeast by NFSR 404 (Divide Forks Road) and to the northwest by NFSR 416 (Rim Road), on the west and southwest by National Forest boundary and NFSR 600 (Windy Point Junction) to 1 mile east of the NFSR 402 (Divide Road) back to the north at NFSR 404 (Divide Forks Road). The area closure is in addition to an expanded road closure as the Divide Road (NFSR 402), from its junction with Big Creek Road (NFSR 403) south to its junction with Wind Point Junction (NFSR 600) will be closed to public access. August 17th 8:30am Good morning community. 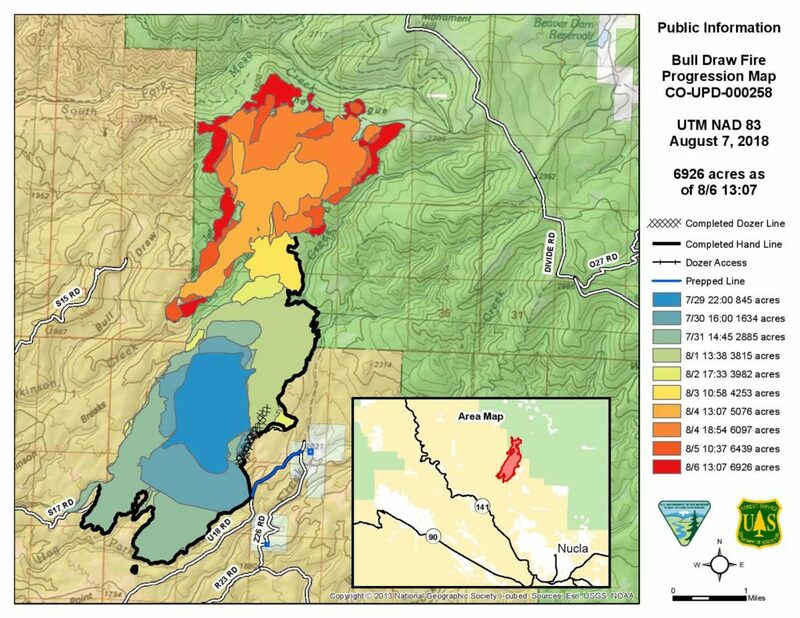 The #bulldrawfire is 28,000 acres and has 21% containment. We’ve turned a corner in the south and we will post a full update in a few hours. Weather: Today’s weather outlook is for partly cloudy skies and a 30% chance of afternoon storm cells. These thunderstorms can bring gusty and erratic outflow winds, along with active lightning. Winds will shift direction today, coming from the southeast in the morning and swinging around to the northwest by late afternoon. Wind speeds will be 5-10mph, with gusts up to 15mph. Temperatures are expected to reach the low 80s on the ridge tops and upper 80s in the valleys. The relative humidity will drop to 18-23% this afternoon. Current Situation: Since our last morning update, the fire grew 1,180 acres. Most of this growth is a result of the fire continuing to push north into Deep Canyon. Afternoon winds are predicted from the southwest and west, which will facilitate the fire’s spread up Deep Canyon and its adjoining side canyons. Engines continue mopping-up scattered pockets of heat around the Campbell Point homes. Crews are addressing threats to these homes from smoldering fires creeping up through unburned fingers of vegetation below these structures. On the eastern flank of the fire, crews are felling hazard trees, thinning the forest edge and removing understory fuels along the Divide Road to prepare for burnout operations later this week. The southern edge of the fire has two different operations. The first operation is utilizing Hotshot and hand crews to construct control lines directly on the fire’s edge up to the point where the fire has currently stalled inside the old 2004 Campbell Fire scar. The second operation is utilizing masticators and dozers to construct a contingency fire line roughly 1-2 miles below the handline. This contingency line provides a second line of defense in preventing the fire from hooking back towards homes and ranches in the Nucla area. Masticators are tracked pieces of equipment that will grind a standing 30-foot tree into chips in less than a minute. The western flank of the fire continues to slowly progress towards natural fire barriers. This western flank of the fire is unstaffed, allowing resources to be utilized on higher priority areas. Closures and Evacuations: A 17-mile section of the Divide Road remains closed. The closure is from the junction of “Brushy Ridge” National Forest Service Road (NFSR) #408, and the Divide Road NFSR #402, to the “Windy Point” junction NFSR #600 Road and the Divide Road #NFS 402. For questions concerning this closure please call the Grand Valley Ranger District at 970-242-8211. August 14, 2018 – 9:00 a.m. Weather: Storms passed through yesterday afternoon bringing with them 1/10 to 1/3 of an inch of rain. The rain only fell along the Northeastern side of the fire. There was not enough rain to impact the fire’s spread. Today, there are still storm cells surrounding areas of the fire. They continue to bring gusty and erratic outflow winds, along with active lightning. Local winds over the fire are down slope, down valley this morning (winds will follow the terrain, down into the lower elevations). Wind will shift directions this afternoon, coming from the north/ northwest at 5-10mph, with gusts up to 15mph. Temperatures remain around mid-80s on the ridge tops and low 90s in the valley. With the monsoon moisture and storm cells present, the relative humidity will be 17-22%. Current Situation: Since our last morning update, the fire has grown 3,410 acres. Due to afternoon storm cells and gusty winds, fire made two main pushes to the northwest and southern edge of the fire. In the northwest fire grew around the Campbell Point/ Coyote Basin area. 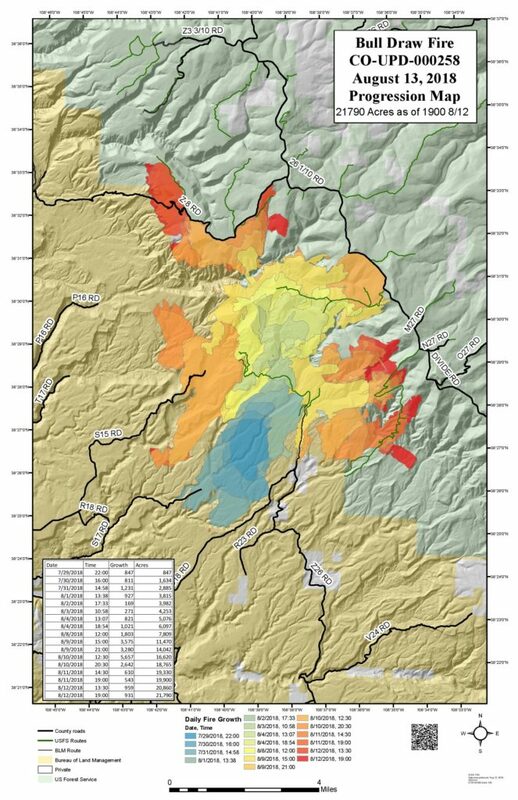 In the southern area of the fire continued to push into the 2004 Campbell fire scar. Engines and crews are working around the Campbell Point homes to reduce the amount of heat in that area. On the northeastern edge of the fire, crews are felling hazard trees and preparing the Divide Road for burnout operations later in the week. The southern edge of the fire has two different operations. The first operation is utilizing hand crews and dozers to construct direct fireline connecting to the old 2004 Campbell Fire scar. The second operation is utilizing hand crews and dozers to construct contingency fire line around the southern area due to values at risk. The western edge of the fire has not gained significant acreage and continues to smolder around natural barriers. This edge of the fire is unstaffed allowing resources to be utilized on higher priority areas. Smoke from the western states, and various fires around the state of Colorado will continue to impact this area. 8/14/18 Update: will be posting the detailed daily update in a few hours. The Bull Draw Fire is 25,190 acres and it grew 3,400 acres in the last 24 hours. Containment is 19%. August 12, 2018 – 9:00 a.m. Weather: Today, there will be storm cells in areas surrounding the fire. The storm cells have very little chance of producing any wetting rain. The winds will be light (2-5mph), coming from the South/Southeast in the morning. This will push the edges of the fire to the North/ Northwest. In the afternoon the winds will increase (7-12mph), and shift directionally coming from the North / Northwest. This shift will push the fire to the South/ Southeast this afternoon. The shifting winds and sporadic gusts from passing storms could cause fire to behave aggressively and erratically. Temperatures will remain in the mid-80s on the ridges and low 90s in the valleys. Relative humidity will be in the mid-teens to low twenties. If slope and winds align, expect significant runs to the North, West and East. Current Situation: The fire grew 1,135 acres since our last morning update. The Bull Draw Fire is a long duration fire. 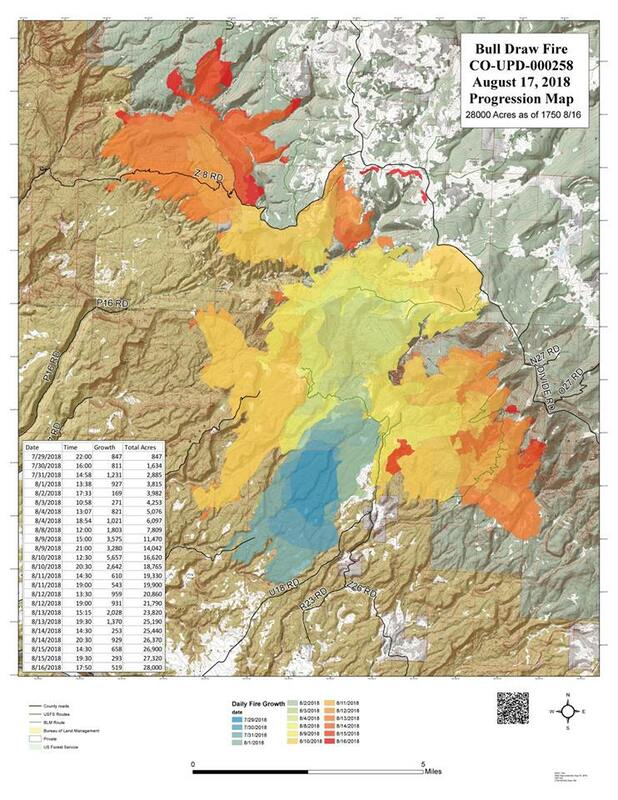 Fire acreage will continue to grow as the fire naturally progresses towards indirect containment lines. Indirect fireline is constructed a safe distance in front of the advancing edge of the fire, and it is often utilized when the direct edge of the fire is unsafe for crews. Yesterday, the fire reached the Campbell Point area. Authorities notified landowners with impacted land. At this time, the only property loss is a single travel camper, with no other structures impacted. Resources were staffed overnight to monitor and patrol structures in the Campbell Point area. The fire continues to push Northwest near structures. Crews on this Northwestern side will perform burnout operations along the Z8 road towards the intersection with Divide Road. Crews on the Northeastern side of the fire are preparing the Divide Road for burnout operations. The Southeast side of the fire has hand crews and heavy equipment constructing fireline to the 2004 “Campbell Fire” scar. 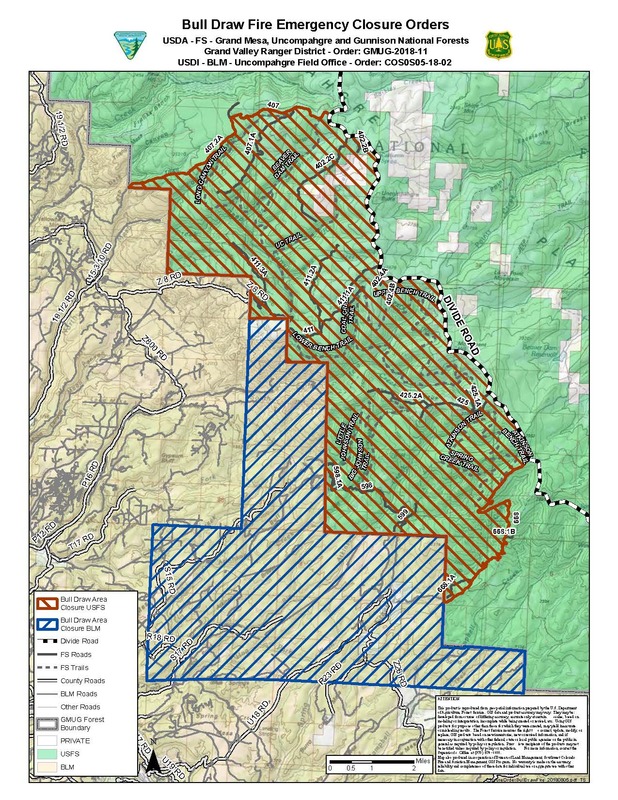 Fireline will continue through the scar, connecting to the Divide Road. When conditions are adequate, and the line is fully constructed, crews will begin to prep for burnout operations. Burning out areas will help close the gap by eliminating fuel between the flame front and the containment lines. The south western/west edge of the fire will be monitored by air craft and will not be staffed due to firefighter safety. 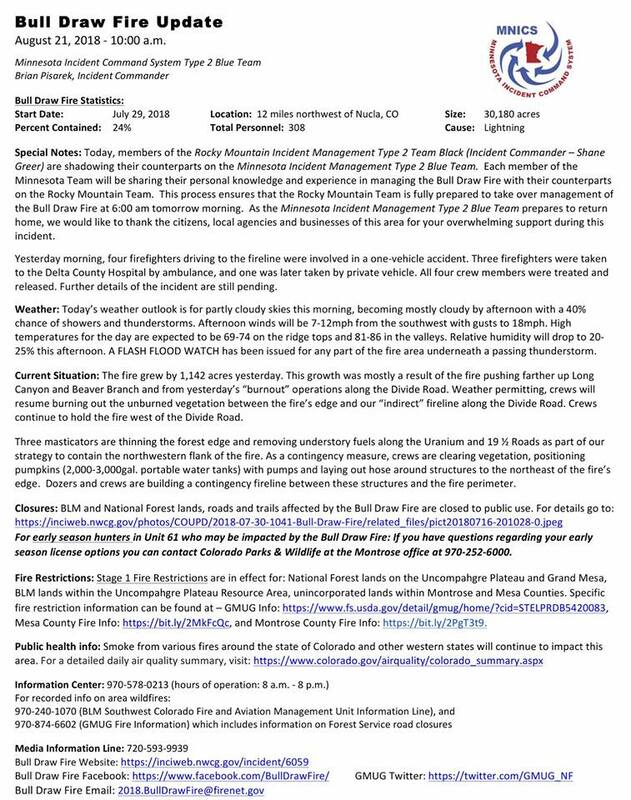 August 11, 2018 – 9:00 a.m.
storms could push the fire aggressively and erratically. Hot conditions will continue with high temperatures in the mid-80s. Relative humidity will rise, but weather conditions and dry fuels could contribute to extreme fire behavior if slope and wind align. If wind speeds increase, the fire has the potential for torching and significant runs. Current Situation: The fire grew 4,723 acres in the past 24-hours and continues to actively push towards the southeast. result large smoke plumes will be likely in the afternoon and evenings. assigned overnight to monitor this area. northeast working along the Divide Road NFSR #402.
area of the old 2004 “Campbell Fire”. This activity might take three to four days. The south, southwest, and western flanks are lightly staffed. and the Divide Road #NFS 402. 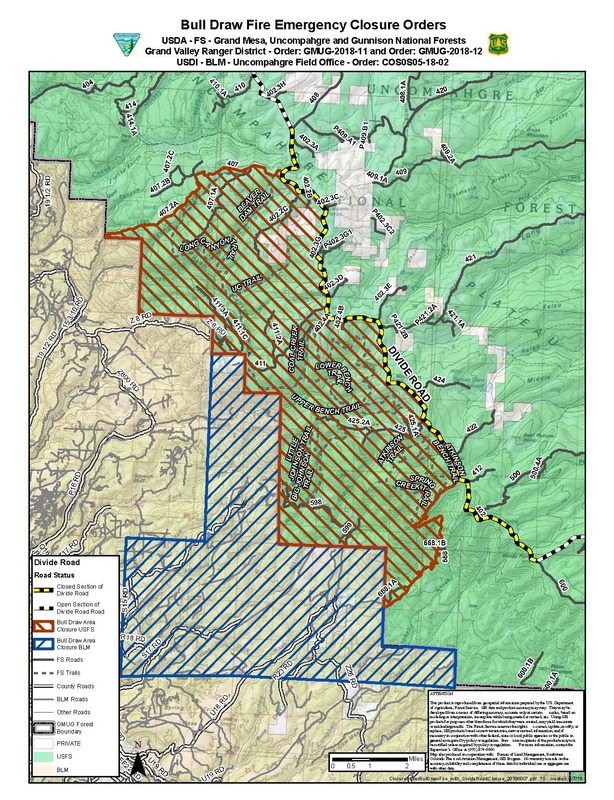 For questions concerning this closure please call the Grand Valley Ranger District at 970-242-8211. 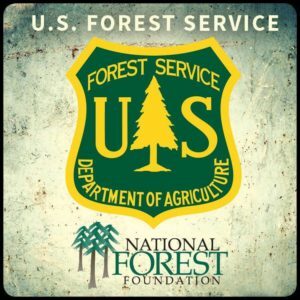 Delta, Colorado, August 8, 2018 – The Grand Mesa, Uncompahgre and Gunnison (GMUG) National Forests have announced the closure of a portion of the Divide Road (NFSR #402) in response to the nearby Bull Draw Fire beginning August 8, 2018, at 12:00 p.m. 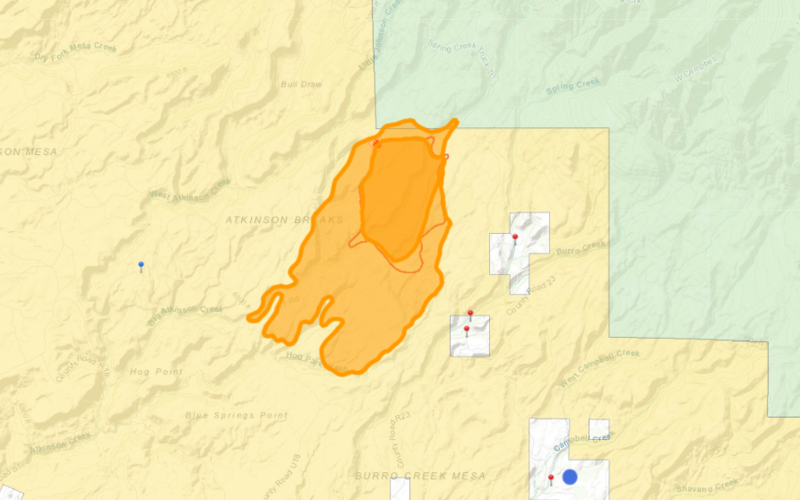 The remote lightning-caused blaze, burning 12 miles northwest of Nucla, has reached approximately 7899 acres and is burning on both the Bureau of Land Management (BLM) and Grand Mesa, Uncompahgre and Gunnison National Forests System Lands. National Forest System Road (NFSR) #402 from the junction of NFSR #408 (Brushy Ridge) and NFSR #402 (approximately 21.5 miles from the junction of HWY 141/NFSR #402), south to the junction of NFSR #600 and NFSR #402 (Windy Point Junction). The closure is approximately 17 miles. This road closure is in addition to the current area closure which includes the area bordered on the southwest by NFSR #668 from the Forest boundary to NFSR #402, on the northeast by NFSR #402, on the northwest by NFSR #407 from the Divide Road to the Forest boundary and on the southwest from the Forest boundary back to NFSR #668. The public is asked to adhere to these closures and pay close attention to all road signage. For questions concerning this emergency closure please call the Grand Valley Ranger District at 970-242-8211. 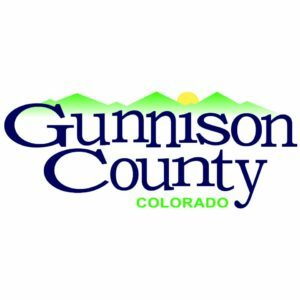 August 8, 2018 – 11:30 a.m.
Special notes: The Grand Mesa, Uncompahgre and Gunnison (GMUG) National Forests have announced the closure of a portion of the Divide Road beginning at 12 p.m today. Closure details: National Forest System Road (NFSR) #402 from the junction of NFSR #408 (Brushy Ridge) and NFSR #402 (approximately 21.5 miles from the junction of HWY 141/NFSR #402), south to the junction of NFSR #600 and NFSR #402 (Windy Point Junction). The closure is approximately 17 miles. This closure is to allow crews to safely prepare for fire-fighting operations – including potential burn out operations. The Minnesota Incident Command System Type 2 Blue Team is now utilizing the Nucla Community Center for fire management operations. We plan to post video updates for the duration of the Type 2 team’s management of the fire. Weather: This week’s hot and dry conditions will continue with high temperatures in the low 90s. Relative humidity will range from 7-12%. Prevailing winds will be from the northwest 4-7 mph. These hot and dry conditions might last until Friday when winds from passing storms could occur near the fire. Current Situation: There have been no structures lost. Yesterday, the fire had a 12% increase in acres and there was limited fire activity on the south, east and west sides of the fire. 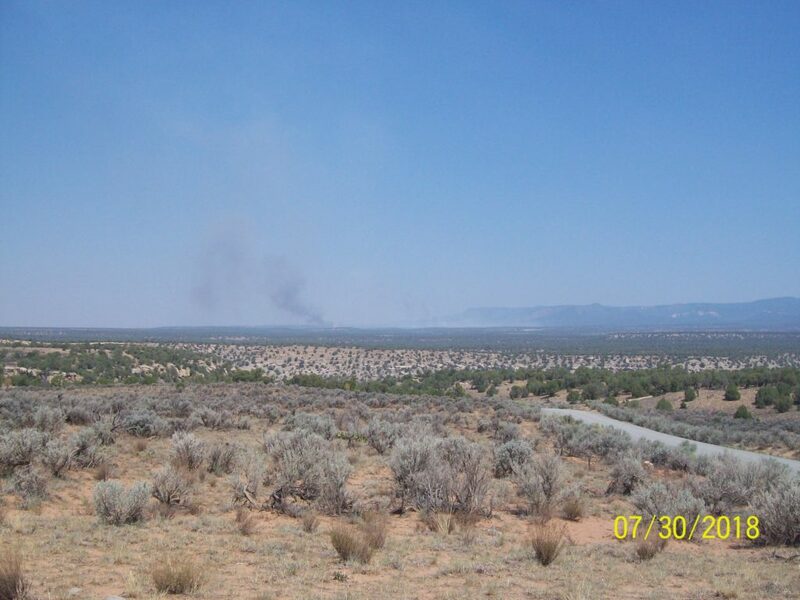 The fire is most active on the north side (Mesa County). The fire continues to back down the ridge at the South Fork Mesa Creek drainage. The Roosevelt Hotshot crew is constructing fire-line to limit the fire spread along the southwest flank. Today, an additional hand crew will assist with hand-line construction and holding the southwest. Most of the crew activity and engine resources will continue to focus on the northwest in structure protection. At this stage, fire managers have the staffing and equipment needed to be proactive and safe in fighting this fire in its current conditions. Current weather conditions and fuels could contribute to more extreme fire behavior on the north slopes if slope and wind align. If wind speeds increase, the fire has the potential for some torching and runs. Closures and Evacuations: There are multiple closures in place for areas affected by the Bull Draw Fire. These are in effect for both public and firefighter safety and to allow fire operations to be carried out successfully. Closures include BLM roads, trails and lands, National Forest System roads and trails, and some county roads. 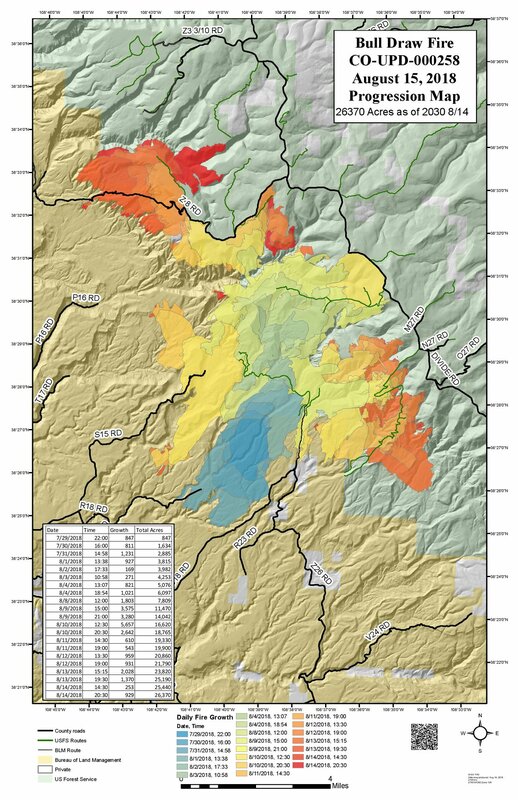 For a map of BLM and National Forest closure areas, go to: https://bit.ly/2AMkyYl. To sign up for emergency and evacuation notifications in Montrose County go to CodeRed at https://public.coderedweb.com/CNE/en-US/BF7ED953CC69. 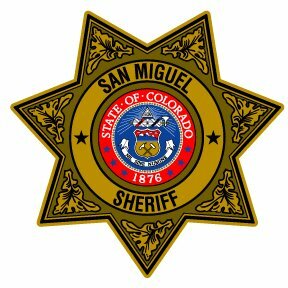 To sign your cell phone up for emergency alerts in Mesa County visit https://member.everbridge.net/index/892807736721759#/login. Public health info: Smokey conditions will persist in the area. For a detailed daily air quality summary for all areas of Colorado, visit: https://www.colorado.gov/airquality/colorado_summary.aspx. Other fires across the western states are also affecting overall air quality and smoke in the area. 8/8/18 Current Situation: Fire behavior was moderate yesterday, and some smoke columns were visible over the fire. There is still potential for severe fire behavior; fuel moisture levels are extremely low. The Bull Draw Fire has been completely consuming heavy fuels and carrying fire through more resistant fuels such as Aspen and pasture lands. As the fire moves into timber, it has the potential to produce larger, uphill runs. The fire is currently most active on the north side (Mesa County) where it is backing down drainages into Mesa Creek. Yesterday, crews performed structure protection tactics in the Weimer Cow Camp and in the cluster of houses northwest of the fire. Firefighters will continue this work today, installing sprinkler systems in those areas to prepare structures in the event of fire spread. There have been no structures lost. A type 1 hotshot crew has been ordered for firefighting efforts on the northeast portion of the fire. Fire in this area is backing into the Atkinson Creek drainage. Air attack is performing water drops in the area to limit fire behavior. On the east fire perimeter, crews will continue patrolling and mopping up (cleaning up). Crews on the south and south west portions of the fire are monitoring that perimeter for areas of heat or fire spread. The west side of the fire is difficult terrain and only allows for foot travel. A second hotshot crew will hike from the south, traveling north along the western side of the fire to scout for opportunities to construct fire line on the west side. There is now an official Facebook page for the Bull Draw Fire: (@BullDrawFire) https://www.facebook.com/BullDrawFire/. Beginning this evening, operations videos will be posted to inform viewers of current fire status and upcoming tactical strategies. Weather: Hot and dry conditions persist today with temperature highs at 90-95F. Relative humidity remains low at 5-10%. Winds are from the west to northwest at 6-10 mph, with occasional gusts up to 20 mph in the afternoon. Chances of wetting rain remains near 0%. Fire weather conditions are very elevated throughout the week; however, the absence of strong winds has kept the area out of a red flag warning thus far. Special notes: Aerial operations will continue over the fire in the coming days. PLEASE DO NOT FLY DRONES. Drones prevent essential firefighting activities, and can cause aircraft to crash, killing pilots and crews. Please report any suspected drone use to law enforcement. 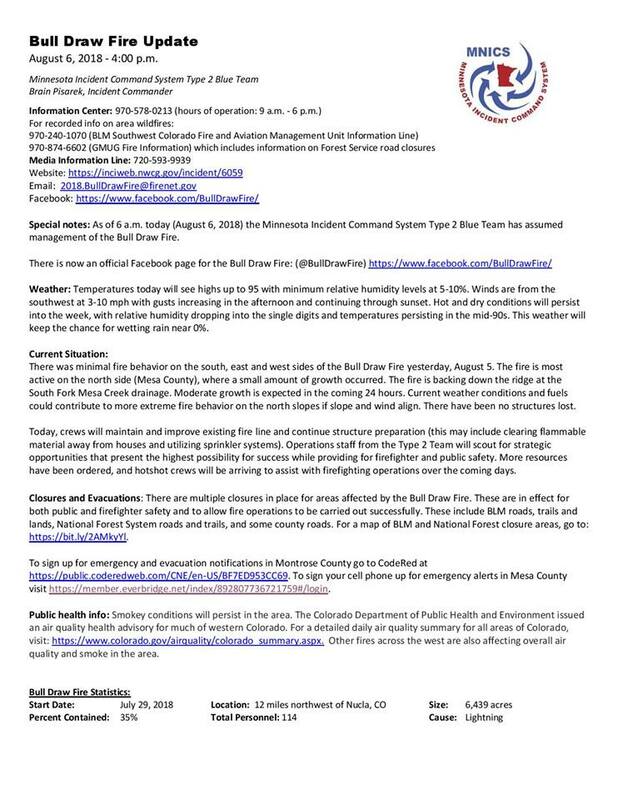 August 6, 2018 – 4:00 p.m.
Special notes: As of 6 a.m. today (August 6, 2018) the Minnesota Incident Command System Type 2 Blue Team has assumed management of the Bull Draw Fire. Weather: Temperatures today will see highs up to 95 with minimum relative humidity levels at 5-10%. Winds are from the southwest at 3-10 mph with gusts increasing in the afternoon and continuing through sunset. Hot and dry conditions will persist into the week, with relative humidity dropping into the single digits and temperatures persisting in the mid-90s. This weather will keep the chance for wetting rain near 0%. There was minimal fire behavior on the south, east and west sides of the Bull Draw Fire yesterday, August 5. 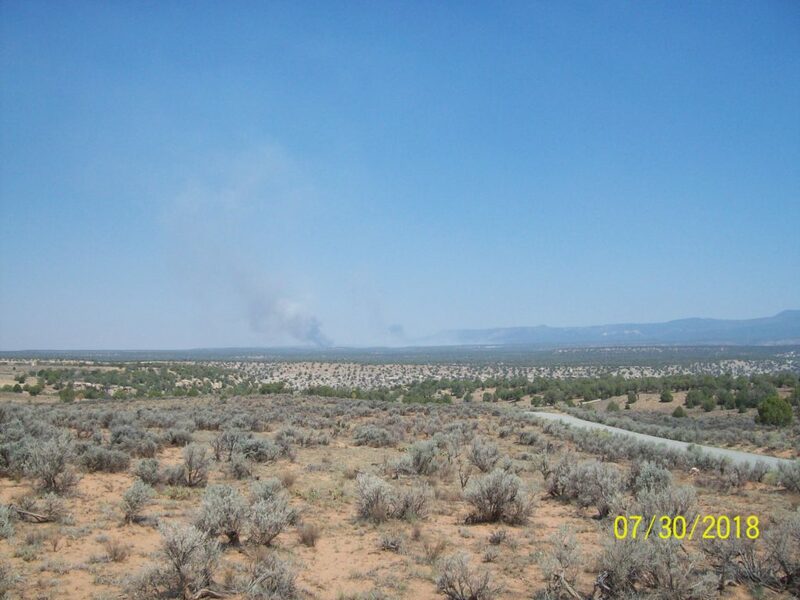 The fire is most active on the north side (Mesa County), where a small amount of growth occurred. The fire is backing down the ridge at the South Fork Mesa Creek drainage. Moderate growth is expected in the coming 24 hours. Current weather conditions and fuels could contribute to more extreme fire behavior on the north slopes if slope and wind align. There have been no structures lost. Today, crews will maintain and improve existing fire line and continue structure preparation (this may include clearing flammable material away from houses and utilizing sprinkler systems). Operations staff from the Type 2 Team will scout for strategic opportunities that present the highest possibility for success while providing for firefighter and public safety. More resources have been ordered, and hotshot crews will be arriving to assist with firefighting operations over the coming days. Closures and Evacuations: There are multiple closures in place for areas affected by the Bull Draw Fire. These are in effect for both public and firefighter safety and to allow fire operations to be carried out successfully. These include BLM roads, trails and lands, National Forest System roads and trails, and some county roads. 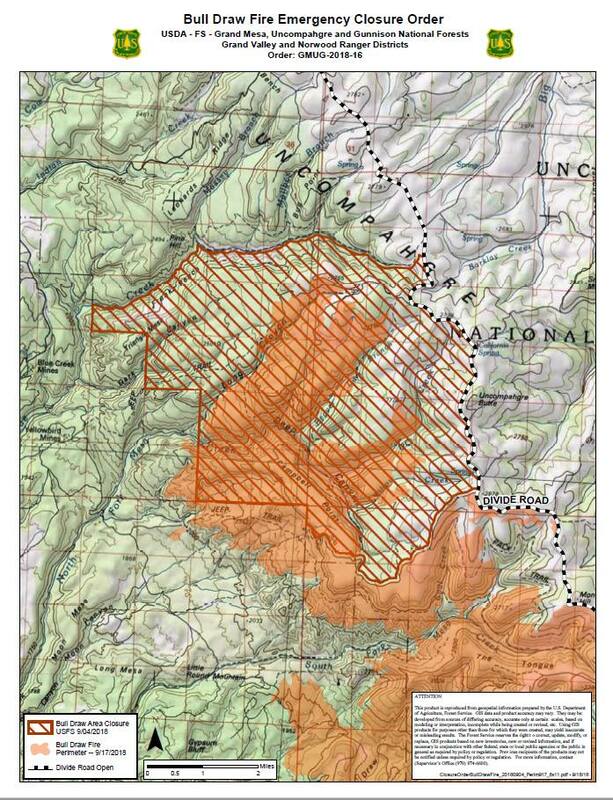 For a map of BLM and National Forest closure areas, go to: https://bit.ly/2AMkyYl. Public health info: Smokey conditions will persist in the area. The Colorado Department of Public Health and Environment issued an air quality health advisory for much of western Colorado. For a detailed daily air quality summary for all areas of Colorado, visit: https://www.colorado.gov/airquality/colorado_summary.aspx. Other fires across the west are also affecting overall air quality and smoke in the area. Fire activity: The crews secured a solid containment line along the east flank of the fire. Winds last night pushed the fire farther north into the Uncompahgre National Forest. Firefighters investigated reports of a new fire start in the area last evening and determined it to be part of the Bull Draw Fire. Today’s operations: Hand crews will continue to work on hotspots particularly on the southern portion of the fire, and anchor into existing cold sections of the containment lines. There was no substantial precipitation in the fire area last evening; however, higher relative humidity is expected to create favorable weather conditions today. Crews expect to increase containment levels. Interfering with fire operations: Officials are asking the public to be respectful of the fire operations working to protect private and public lands in the West End. Please stay away from fire fighting equipment and the areas where the resources are staged. Interfering with fire operations is a Class A federal misdemeanor, subject to up to 1 year in prison and/or $100,000 fine. 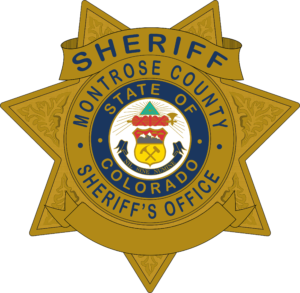 Please report anything suspicious to the Montrose Regional Dispatch Center (970) 252-4010 or (970) 252-4020. • Forest Service Roads 425, 598, 599 and 668. These closures also affect the following trails: 616, 617, 623, 624, 622 and 625. • These closures are in effect for firefighter and public safety. Fire managers ask members of the public to take care while driving in the general fire vicinity, as fire vehicles and equipment are present along narrow, rough and windy roads in the area. 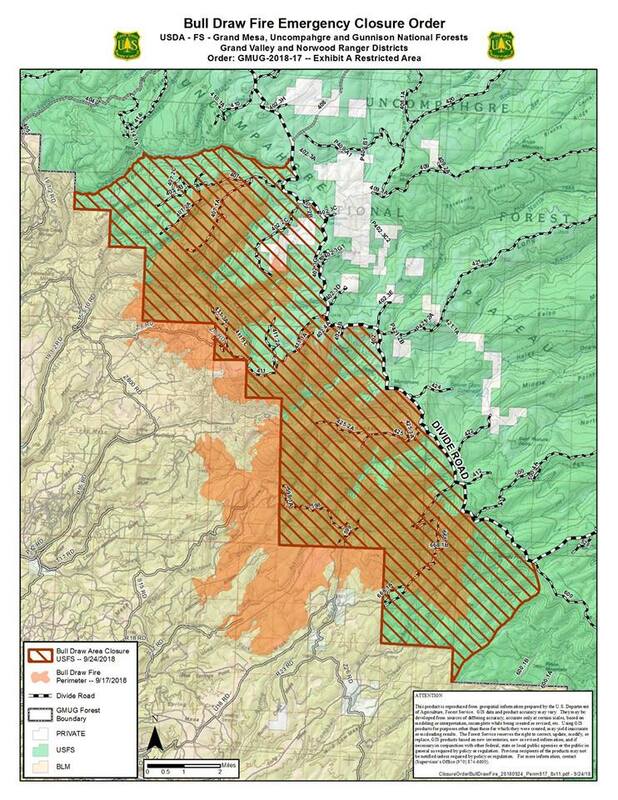 Start Date: July 29, 2018 Size: Approximately 3815 acres August 2, 2018 at 8 a.m.
Fire activity: The fire had minimal growth overnight compared to the last few days, spreading east into an old burn scar and farther north onto the Uncompahgre National Forest. Fire fighting efforts continue to focus on protecting private resources and other values at risk primarily along the east flank of the fire. Today’s operations: Hand crews and bull dozers continue working to secure contingency lines off the U18 Road, patrolling for hot spots on the east and southern flanks, and evaluating burn severity within the fire perimeter. 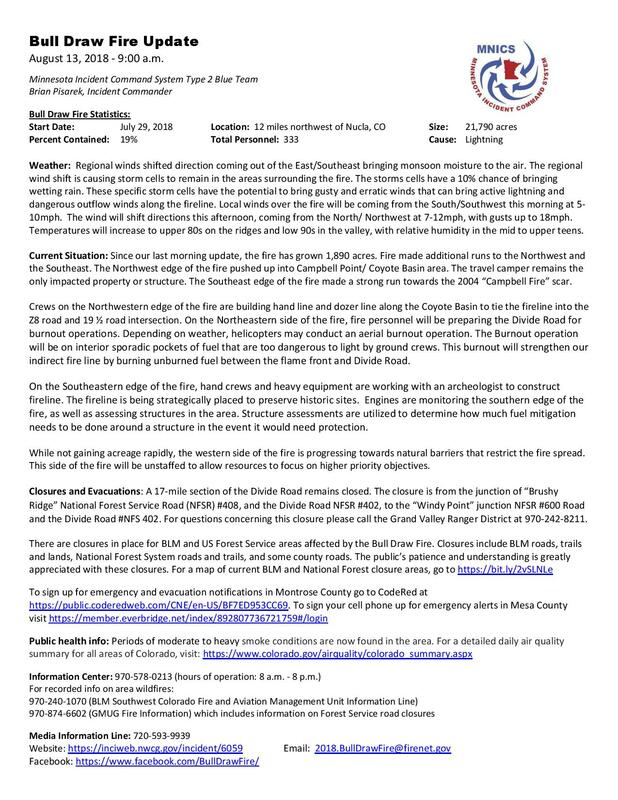 Crews are hopeful for larger containment gains today with favorable wind conditions and weather outlook as well as better familiarity with the landscape. Forest Service Roads 425, 598, 599 and 668. These closures also affect the following trails: 616, 617, 623, 624, 622 and 625. These closures are in effect for firefighter and public safety. Fire managers ask members of the public to take care while driving in the general fire vicinity, as fire vehicles and equipment are present along narrow, rough and windy roads in the area. Smoke impacts: Smoke and ash may be visible from various locations in San Miguel, Delta and Montrose counties. Other fires across the west are also affecting overall air quality and smoke in the area. The Colorado Department of Public Health and Environment issued an air quality health advisory for much of western Colorado. For information on smoke impacts to air quality, visit https://www.colorado.gov/airquality/colo_advisory.aspx. 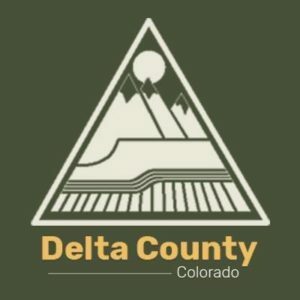 Delta, Colorado, August 1, 2018 – The Grand Mesa, Uncompahgre and Gunnison (GMUG) National Forests have announced a series of road and trail closures in response to the Bull Draw Fire. 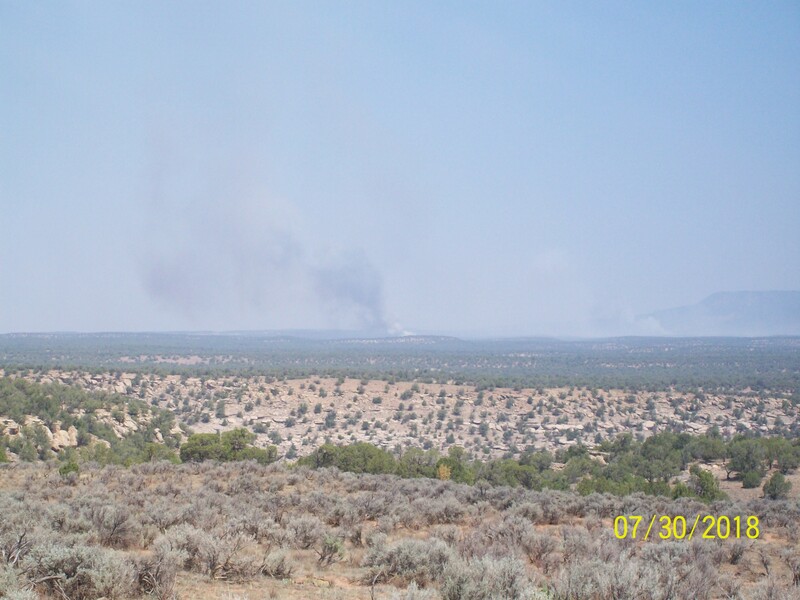 The remote lightning-caused blaze, burning 12 miles northwest of Nucla, has reached approximately 3600 acres and is primarily burning on Bureau of Land Management (BLM) land, with a small portion crossing on to the GMUG. NFST #625 (Upper Bench Trail), which will be closed at the end of NFSR #425.1A to prevent access to the other trail systems listed. These closures are being enacted in the interest of public health and safety. The public’s patience and understanding is greatly appreciated on this manner. For questions concerning these emergency closures please call the Grand Valley Ranger District at 970-242-8211. Engines and air support responding to the 300-acre lightning-caused Bull Fire, 12 miles northwest of Nucla. One structure is threatened; structure protection is in place. Smoke is visible from various locations in the area. More information available in the morning.